FILE - Turkey's President Recep Tayyip Erdogan speaks in Ankara, March 19, 2018. Erdogan has said that candidates deemed sympathetic to the PKK who win in the March 2019 local elections will be removed. Turkish President Recep Tayyip Erdogan, whose AK Party is facing major defeats this month in local elections, is being accused of behaving like a "dictator" after his threat to remove victorious pro-Kurdish mayoral candidates. Erdogan, addressing supporters this week, issued a stark threat to voters in Turkey's predominantly Kurdish southeast: Candidates deemed sympathetic to the PKK Kurdish separatist group who are elected will be removed. "If you happen to send the opportunities provided by the state to Qandil [where PKK leaders are based in neighboring northern Iraq], we will once again, immediately and without waiting any further, appoint our trustees," Erdogan said. The warning was aimed at Turkey's second-largest opposition party, the pro-Kurdish HDP. Ankara accuses the HDP of being the political wing of the PKK, a charge it denies. Already, dozens of elected HDP mayors have been removed from office and jailed, accused of aiding the PKK. The HDP's leadership is calling on voters to take back control of the towns and cities seized by Ankara. The pro-Kurdish party dismisses terrorist allegations against its candidates. "If they remove any of our successful candidates, it's not that the elected mayors are terrorists but rather Erdogan is a dictator," said Ertugrul Kurkcu, honorary president of the HDP. Kurkcu points out the Higher Election Board, which administers elections in Turkey, has validated all the HDP's mayoral candidates. The HDP claims any alleged transgressions by its candidates during campaigning should be a matter for the Turkish judiciary, rather than the president. A demonstrator holds a picture of Selahattin Demirtas, jailed former leader of pro-Kurdish Peoples' Democratic Party (HDP), during a rally in Istanbul, Turkey, Feb. 3, 2019. Erdogan's warning is being interpreted as an attempt at voter intimidation. "This is a kind of a threat to Kurdish voters: If you want to have peace and tranquility in the region, you have to elect my candidates. If you vote for the opposition, I will sack the mayors. I am going to lead you like sheep," said Kurkcu. "But after all these huge struggles for democracy, I do not see honorable Kurds or honorable citizens who will accept this threat. Instead, it provokes anger and rebellion." Kurkcu's position may be well-founded. The HDP "will sweep all Kurdish-majority cities and towns despite massive intimidation and black propaganda," predicted analyst Atilla Yesilada of Global Source Partners. Analysts say there is growing anger among many Kurds over the security crackdown that has been in place since the collapse of the 2015 peace process with the PKK. In Turkey's predominantly Kurdish southeast, many towns and city centers were reduced to rubble as security forces ousted Kurdish fighters. Human rights groups say more than 200,000 people have been left homeless. 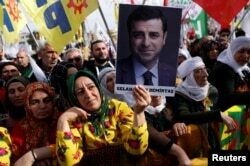 Along with over 80 pro-Kurdish HDP mayors removed from their posts and imprisoned, dozens of the party's parliamentary deputies languish in jail, including its former charismatic leader, Selahattin Demirtas. They are all being held on terrorism charges. State-appointed trustees now administer nearly all towns and cities in southeast Turkey. Many of the cultural reforms encouraging the Kurdish language have been rolled back, including the use of Kurdish on official signs. Erdogan, in his early years in power as prime minister, had positioned himself as an advocate for Kurdish rights. He was rewarded electorally with his AK Party, securing more votes than the HDP in polls. However, the collapse of the peace process with the PKK amid mutual recriminations saw Erdogan abandon the courting of Kurds and turn toward Turkish nationalism. "There is a lot of distrust by Erdogan. Erdogan was sincerely believing in the peace process and believes the PKK and HDP abused this," said international relations professor Huseyin Bagci of Ankara's Middle East Technical University. FILE - Devlet Bahceli, left, leader of the Nationalist Movement Party, or MHP, and the main ally of Turkey's President Recep Tayyip Erdogan, right, shake hands before a meeting at the presidential palace in Ankara, June 27, 2018. 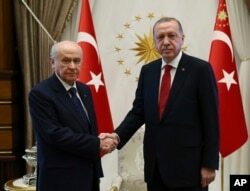 Since the December 2015 general election, Erdogan's AK Party has deepened its relationship with Turkey's hard-line Nationalist Movement Party (MHP), which has been in the forefront of calls for a crackdown on the pro-Kurdish movement. With the Turkish economy mired in recession and public discontent mounting, Erdogan now depends on the MHP's support in the March elections. Analyist Yesilada said Erdogan has little choice but to continue his hard-line rhetoric against the pro-Kurdish movement. "AKP doesn't have the votes to retain Istanbul and Ankara," Yesilada said. "Erdogan has to throw something to [MHP Chairman Devlet] Bahceli. ... So we will see the worst manifestations of populism." However, the HDP is determined to make Erdogan pay a heavy electoral price. "In western Turkey, our party is not listing candidates in seven major cities," said Kurkcu, "meaning that we are directing our voters, around 10 percent of the electorate, to add their vote to the general opposition. This is not a vote for the main opposition but rather against Erdogan." The HDP's surprise move could prove decisive, with opinion polls indicating the opposition ahead in many of Turkey's main cities and Istanbul too close to call. Analysts suggest a serious setback for the AKP could be the impetus for Erdogan again resetting the political agenda by reaching out to Kurds and abandoning his Turkish nationalist ally.